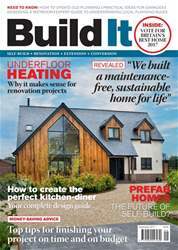 It’s awards season at Build It HQ, which means the team has spent the last few weeks sparring over which of the homes we’ve featured in the past year most deserve to be shortlisted for this year’s Best Self-Build or Renovation Project category. I think we have a stunning line-up – but it’s fair to say some fantastic schemes missed out and there were a few tense discussions as we whittled down the contenders (page 19). Log on to www.self-build.co.uk/vote to read more about the projects and help us choose the winner!